Dental implant are very strong, durable, and stable and will last for many years. We have the latest technology to help you achieve a whiter smile. We are thrilled and focused on tooth whitening. At Winning Smiles Dentist, we’re all about you, the patient. We understand how important it is to have the confidence to smile, so that’s why we strive to deliver the highest quality dental care while ensuring your dental appointment is a positive experience. We know that it’s easy to find a dentist in Blacktown and the Western Sydney region, but we pride ourselves on being different from the rest. We go above and beyond to ensure that your experience at our Blacktown and Denham Court practice is as pleasant and relaxing as possible. We have all the comforts you may find in your own home, as we like to think of you and all our patients as part of our dental family. We offer many different dental services; catering to kids, older patients and everyone in between. 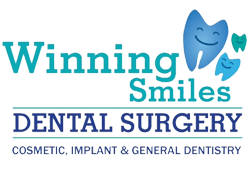 Winning Smiles Dental Surgery provide specialize services that include dental implants, Pain-Free Dentistry & dentist Parramatta, clear aligners and braces care. We are proudly the dentist who opens 7 Days and with a patient from Parramatta to Blacktown. At Winning smiles dentists, our most experienced dentist provide teeth related treatment across the western Sydney including suburbs as Quakers Hill, Glenwood, Penrith, Bella Vista, Toongabbie, Rooty hills, Marsden Park, Stanhope gardens, Baulkham Hills, Westmead, Windsor, and Richmond. We are open 7 Days a week and will strive to see patients who are suffering in pain as soon as possible. Open weekends, saturday and sunday.